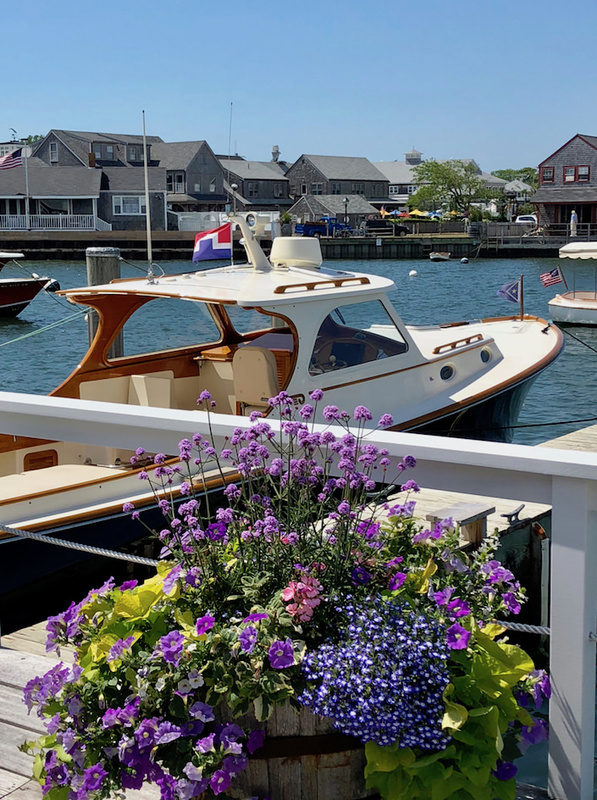 In downtown Nantucket, across from where the car ferry ushers in its seasonal visitors, sits the historic Old North Wharf. 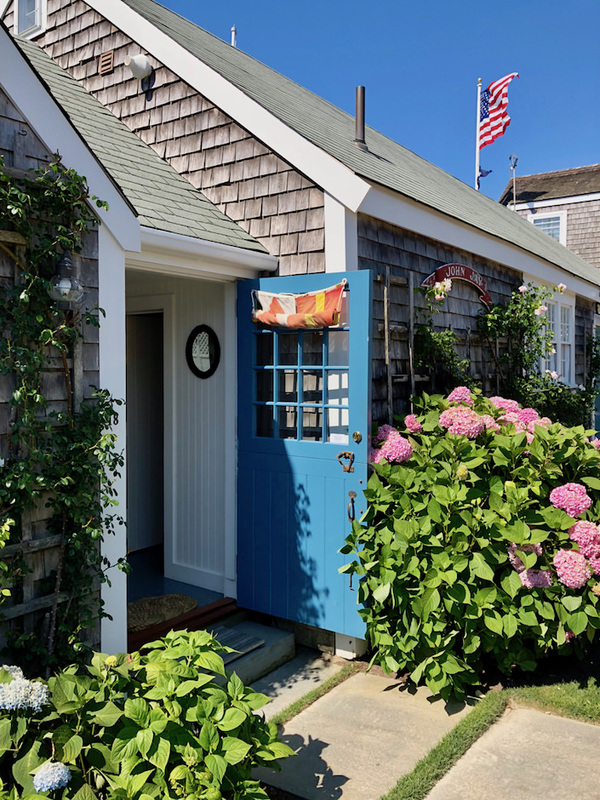 Originally built in 1750 for the burgeoning fishing trade, the tiny shacks lining its width were eventually transformed into cottages for more residential use. 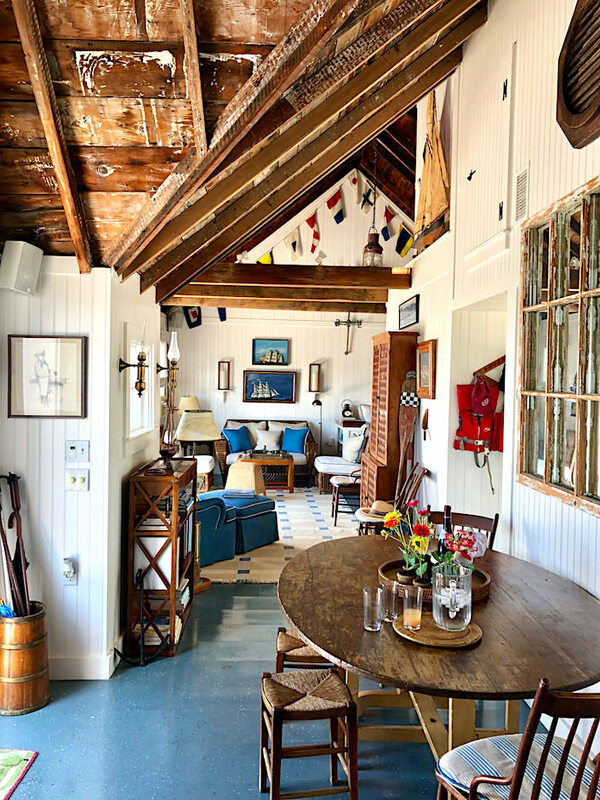 One of the most charming boathouses is actually two cottages combined, that its owners use for entertaining, for occasional guest overflow from their in-town main house and for prepping outings on their classic Hinckley Picnic Boat, docked off of their deck, below, where one of the Nantucket by Design All-Star Private Dinners will be held (more about that at the end of the post). 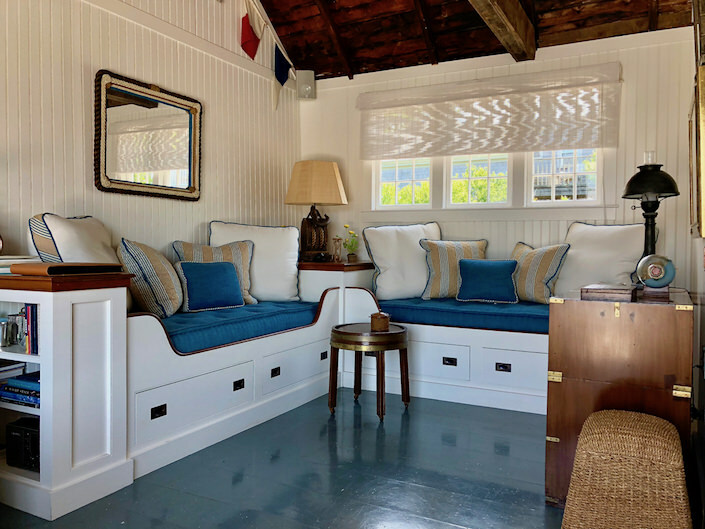 Designer Gary McBournie (whose own island home was recently featured in an At Home With video visit), who was brought on board to update the boathouse, revamped it into a chic space reflecting nautical life. Surrounded by hydrangea, the front door sets the tone with a bright ocean blue. 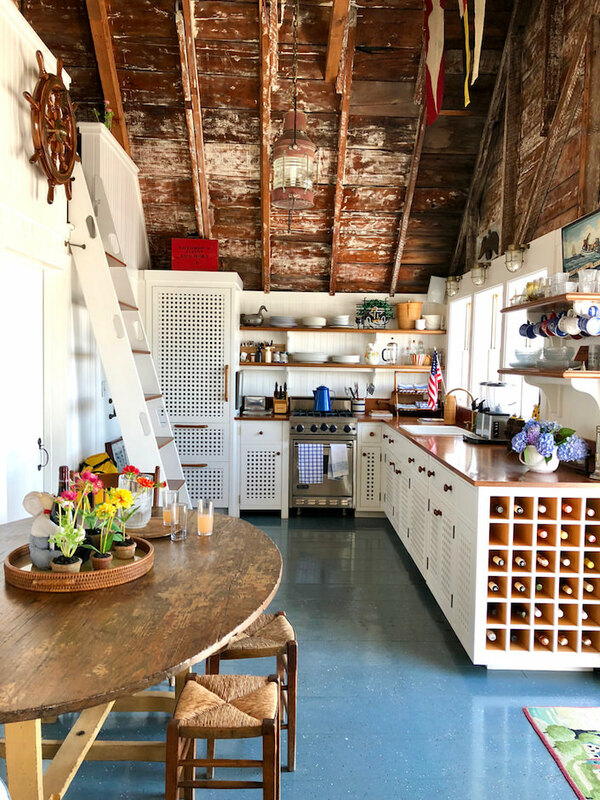 Inside, the beams and ceiling are reminders of the original structure while the white beadboard and and crisp color scheme add a fresh modern touch. 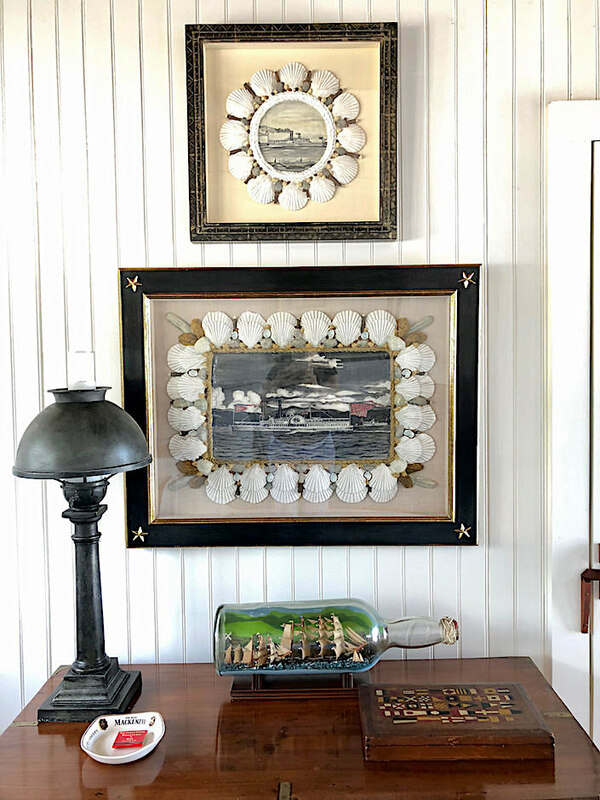 and accessories are effortlessly included in the mix, adding their personal story and history to the space. 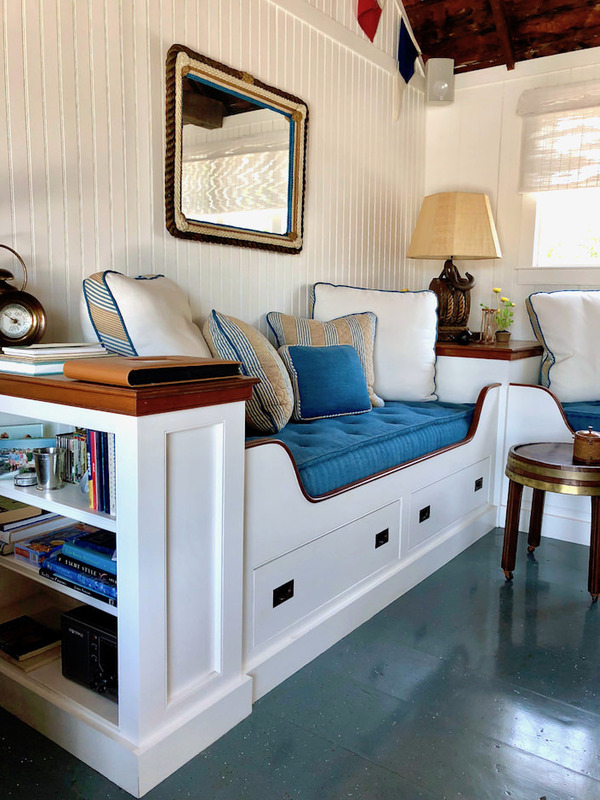 with great custom details from the mattress upholstery to clever storage solutions. At the other end of what is essentially a loft-like room, is the kitchen, with an eating area in between. The ladder leads up to a sleeping loft. 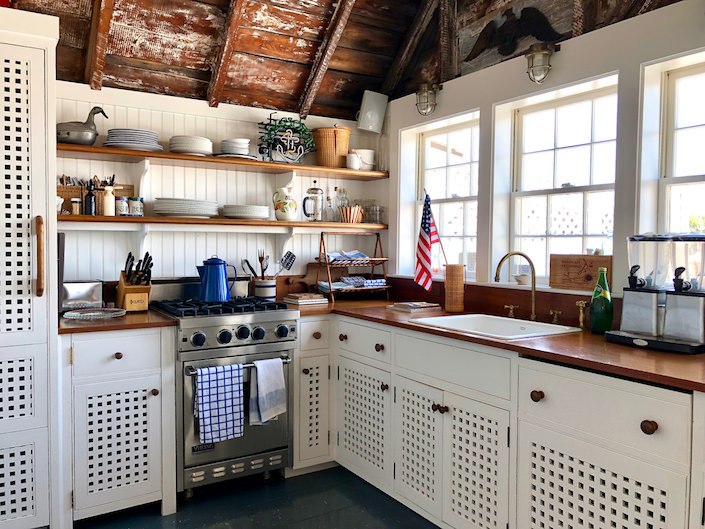 The kitchen is a great melding of form and function, again referencing boat-like design, with teak counters, open shelving and that fabulous grill-like woodwork and handles, inspired by a 1920’s yacht. 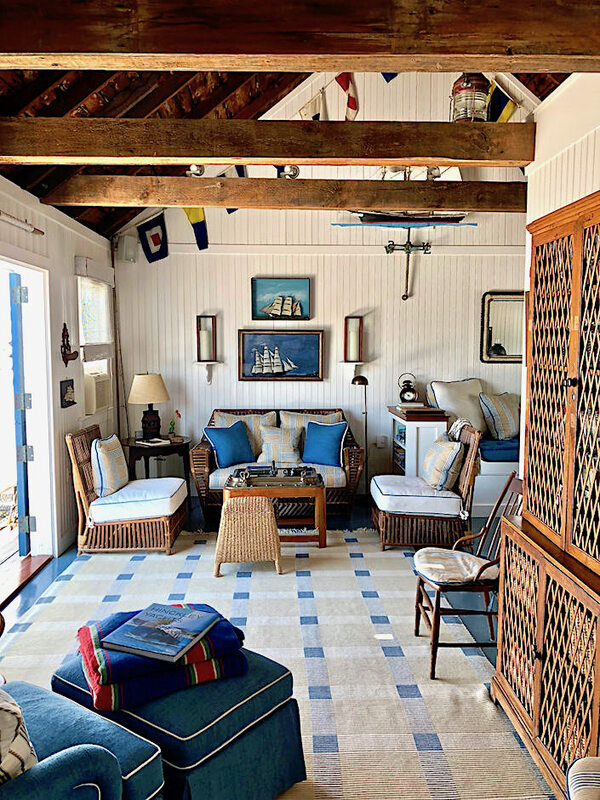 Looking back toward the seating area, you can see the space is united by the floor, painted throughout with Benjamin Moore deck paint and then treated with a decorative splatter pattern, serving up practicality with style. 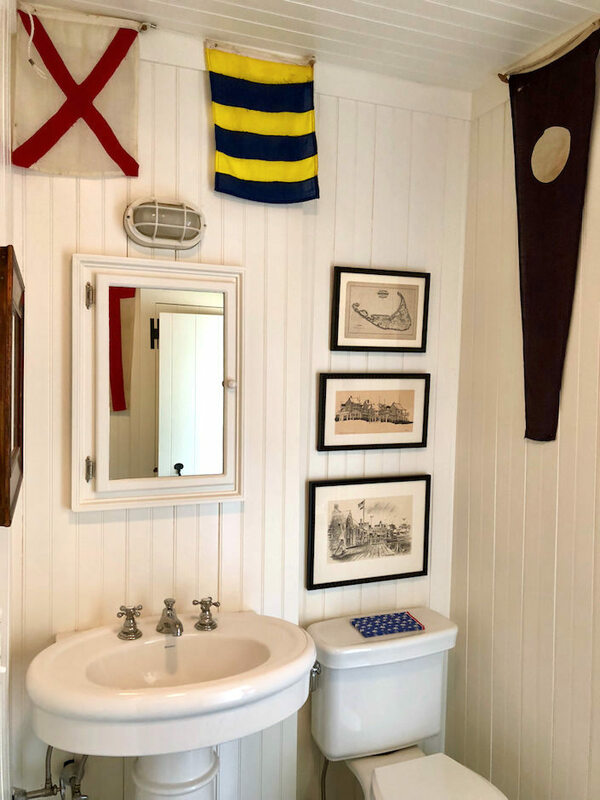 were found on island, items were sourced from as far away as the south of France, including the vintage nautical flags in the bathroom which were the original color scheme inspiration. Surprisingly, even the old Skipper wharf restaurant sign, below, was found in France. 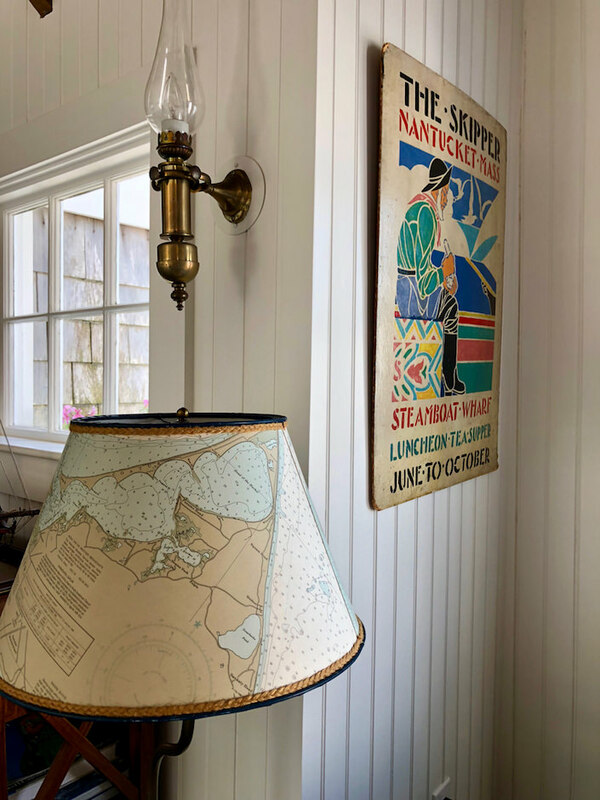 And then McBournie added fun custom touches like the lampshade, below, fashioned from a Nantucket chart map and trimmed with rope. 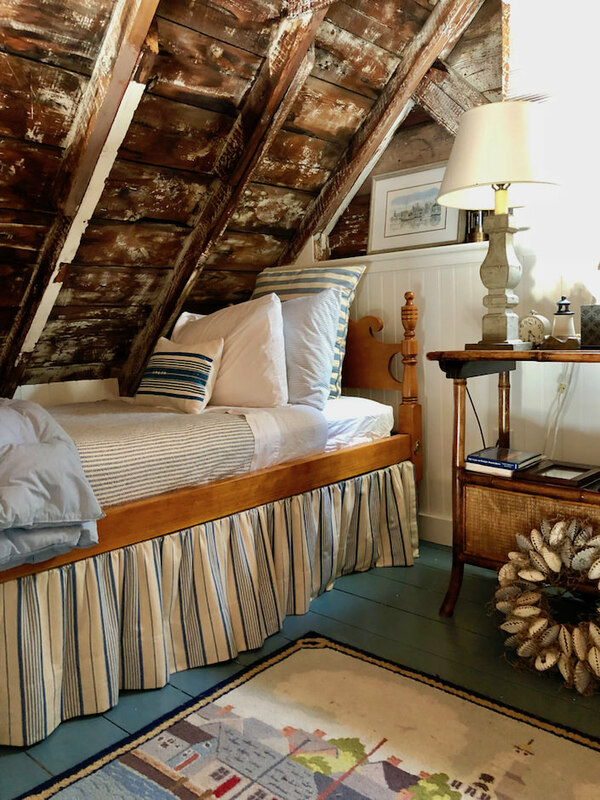 Upstairs is a charming sleeping loft, where the sound of the waves can lull you to sleep, snug as a bug under the eaves. 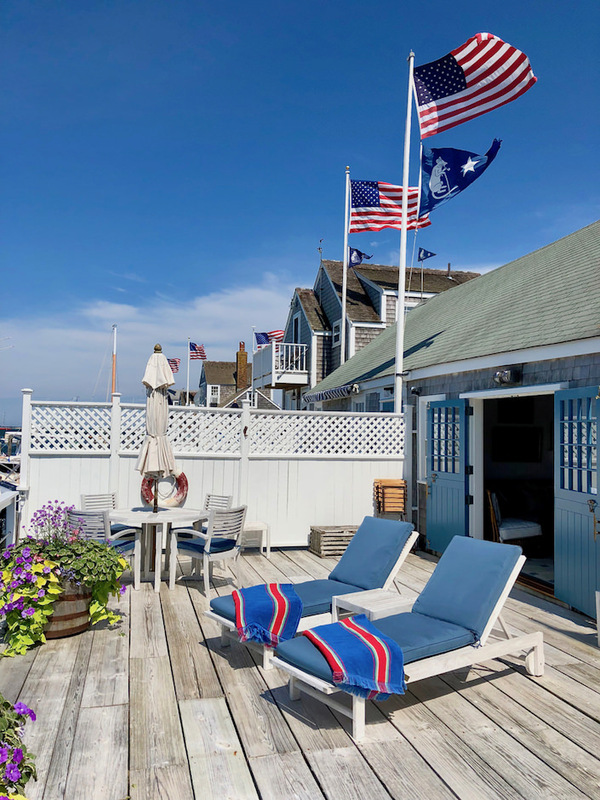 The best of Nantucket summers include outdoor living and the boathouse happily opens up from both kitchen and sitting area onto a generous deck overlooking the water. who will be hosting lucky guests for one of the intimate candlelit dinners at the boathouse. 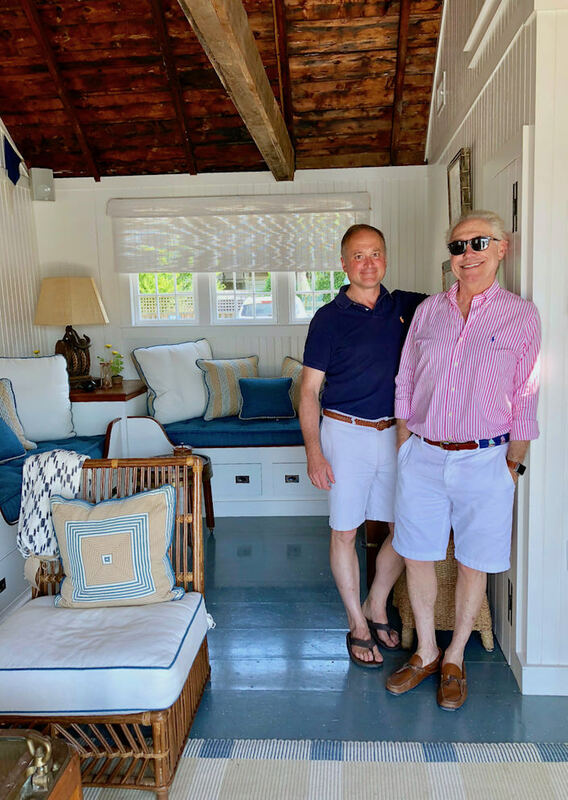 Other dinners, each with a special design guest, are being held at NHA historic sites (including Greater Light) as well as several private Nantucket Homes. But, if interested, get your tickets now – I understand they’re quickly selling out! 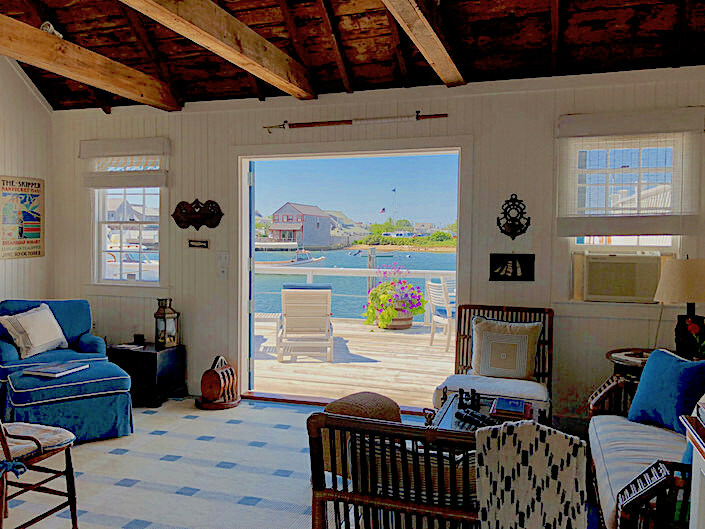 This entry posted in architecture, interior design, Nantucket, Nantucket House Tours, travel. 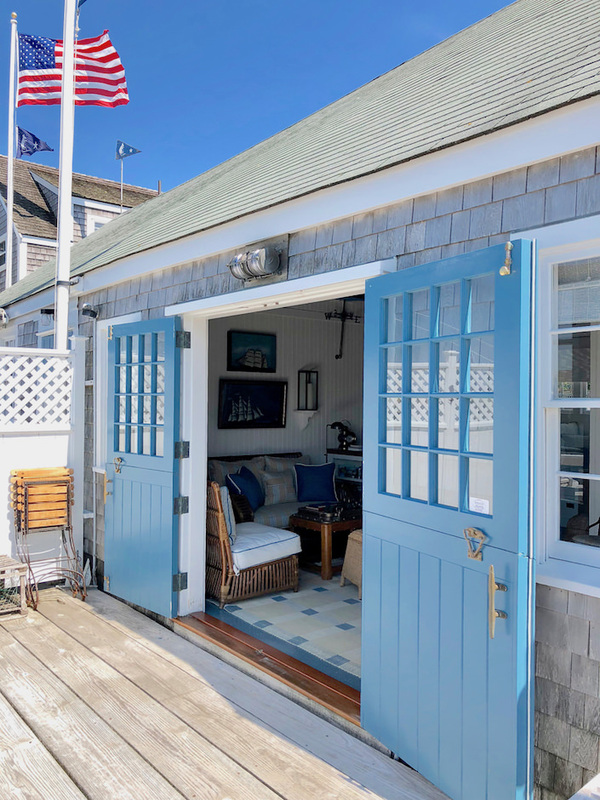 Entry Tags: boathouse, house tour, interior design, Nantucket, nautical style Bookmark the permalink. So beautiful. Thank you. 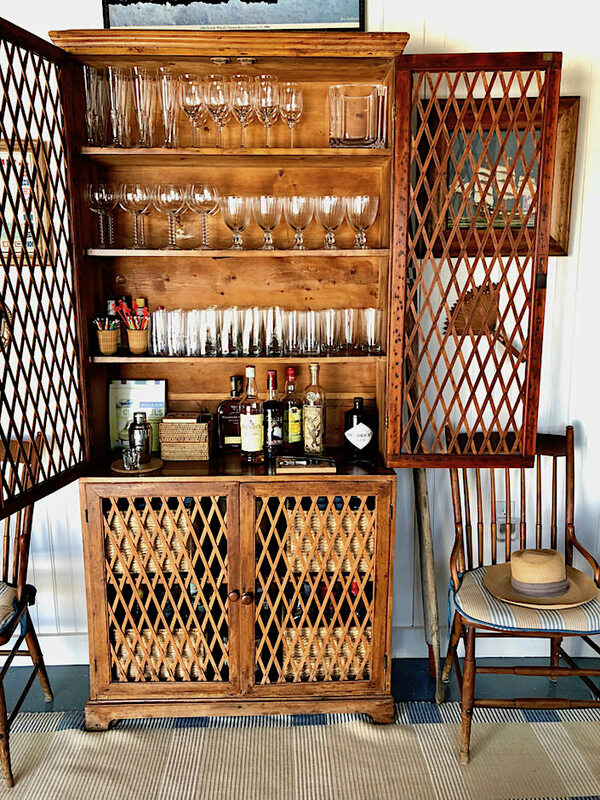 Love Nantucket! This was just charming! I especially love the floors done with paint and additional splatters…. 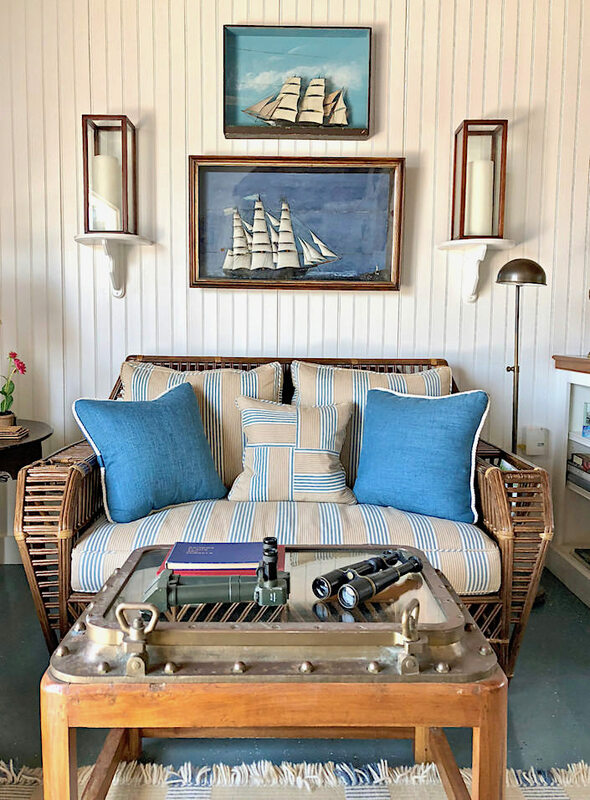 Did the owners happen to mention where the beautiful geometric rug was from? Thank you! 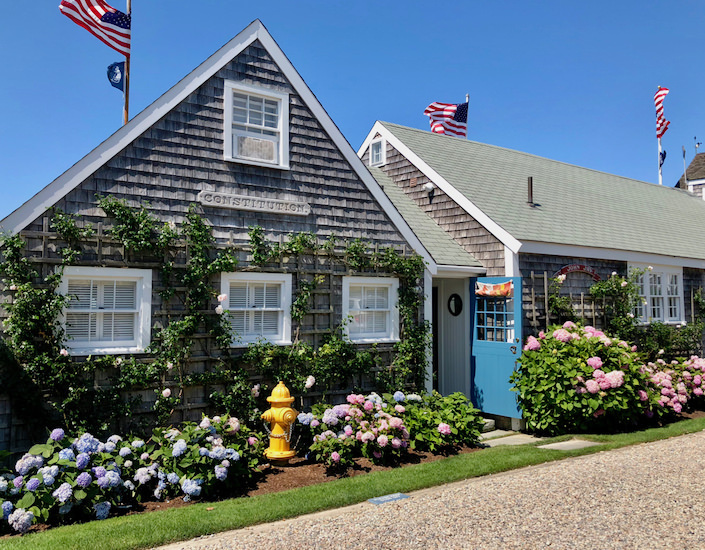 Thank you for sharing,I am reading books by Elin Hilderbrand and she writes about Nantucket. I love this house! 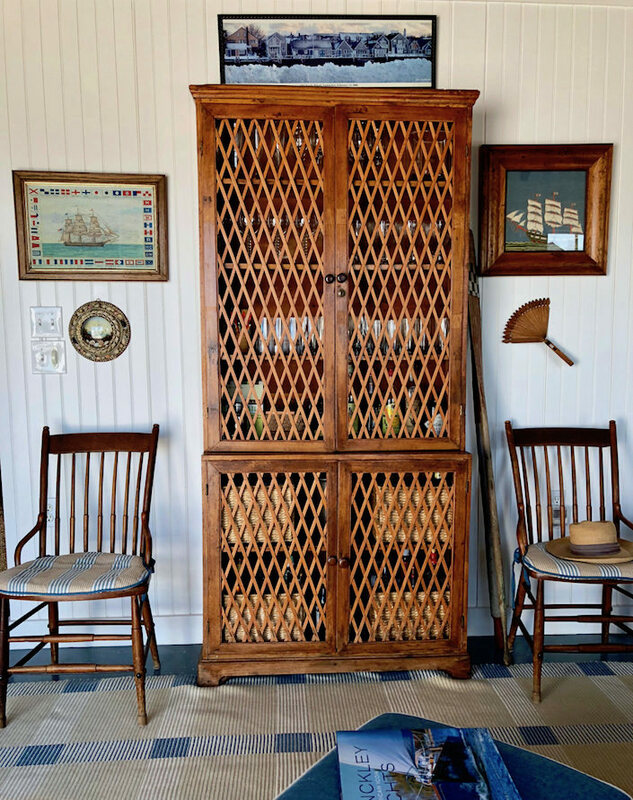 It’s the perfect beach house harkening back to a simpler time. 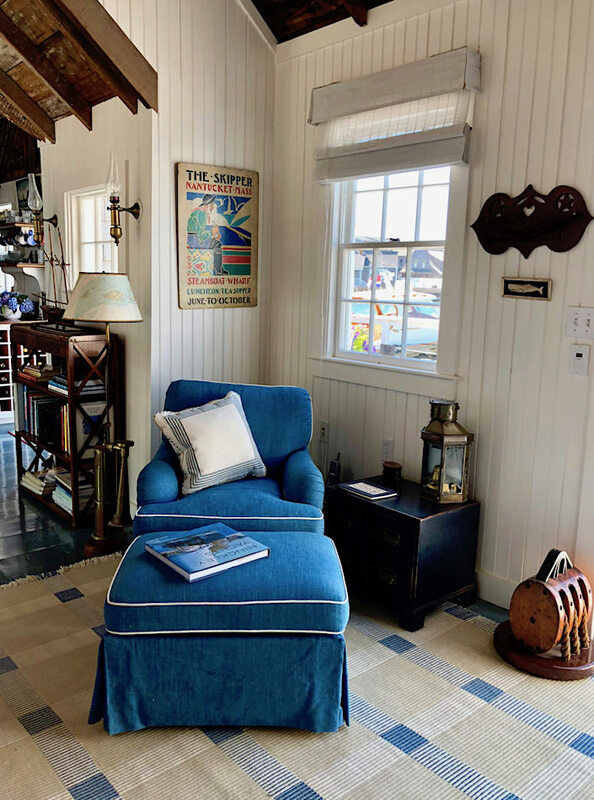 I remember hanging on to a shelter magazine, it may have been House Beautiful, for years just for the spread on this boat house and only recently, reluctantly parted with it. Now I’ll bookmark this story! Ive just got around to reading and viewing this. 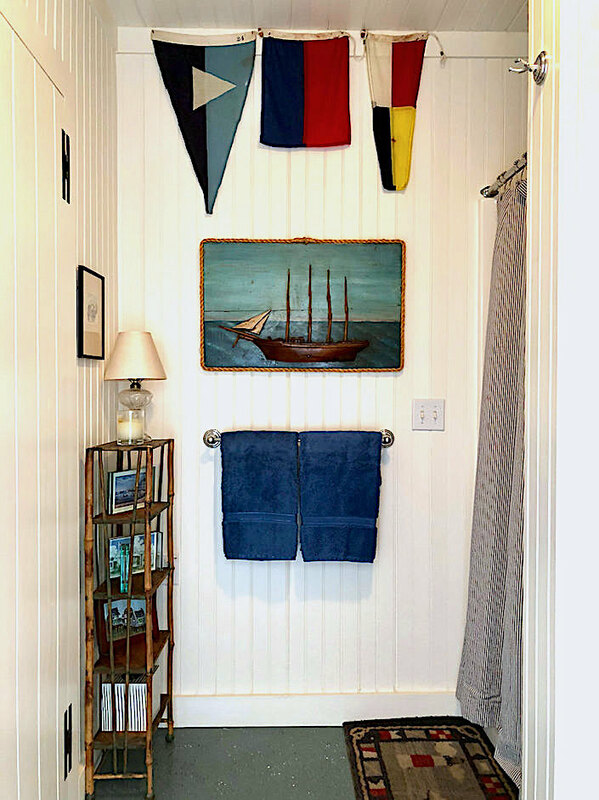 Their little boathouse is so beautifully put together Stacey. 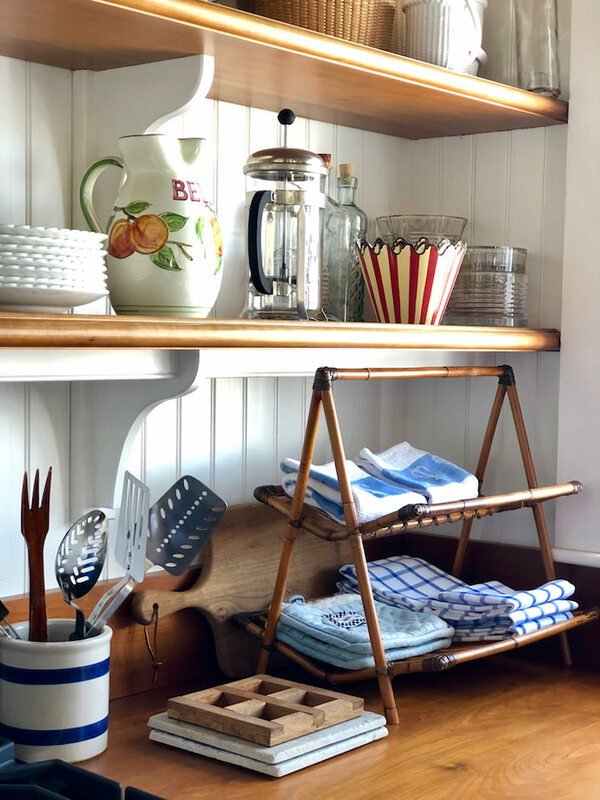 Everything is perfect, I particularly love the bamboo pieces scattered about, especially the little rack housing the tea towels in their kitchen, its so cute. 80 queries in 0.502 seconds.